Pre-Christmas was busy as usual at St George’s. Our Advent Carol Service on Sunday 29th November was candle lit as usual; this year we needed to be even extra careful so as to not allow any stray wax to drip onto our new red pew cushions. The choir and the organ music were beautiful as always and we sang some of my favourite carols including “On Come, Oh Come Emmanuel”. The “countdown” to Christmas had begun! On Saturday 5th December was our Church Bazaar with stalls in the decorated hall selling crafts, cards, jams and chutneys etc. I was helping on the bookstall. We had taken over the entire small side room and had sections for novels, travel, history, cooking and gardening, plus jigsaws, DVD’s and CD’s. There was a chocolate tombola, a big tombola and a Grand Raffle. It was a very successful day and raised £2,055 for church funds. The Memorial Service on Monday 14th December was quiet and reflective, with names read out from the “stars” placed on the Memorial Tree. We queued to have tealight candles lit which we then placed on the floor in front of the altar in memory of our own departed loved ones. Our Sunday School Nativity Play was part of our Sunday worship, specially written for us, with “Monday’s Child” etc. leaving their chores to seek out the infant Jesus. On Saturday 19th December we sang carols in the Precinct along with other local churches. The Christmas Carol Service with readings, choir and much loved carols was on Sunday 20th, followed by traditional hot punch and mince pies. An extra this year was a visit to the Chichester Planetarium - not the easiest place to find, even with a SatNav! In comfy chairs, in the darkened arena, we watched the night sky as it would have appeared at the time of Jesus and heard various theories as to how its appearance might have come about and been interpreted by Wise Men of olden times. A fascinating and most instructive afternoon. Midnight Mass is always very special and quite emotional. I love the part where we sing “Yea, Lord we greet thee, born this happy morning.” - Before we tuck into yet more mince pies! And so another Christmas and the end of another year. 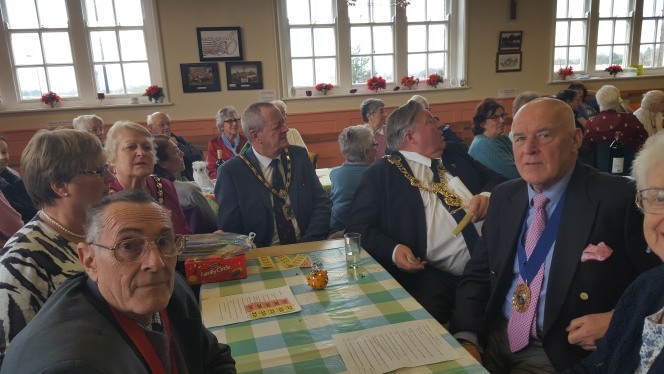 On Monday 14th December the Help in Bereavement group held their Christmas Coffee Morning, attended by no less than 4 Mayors. Pictured are The Lord Mayor of Portsmouth, and the Mayors of Havant, Fareham and Gosport.